Sarah Nader - snader@shawmedia.com Juna Sanchez (left) of McHenry is seen by Rachel Bukowski, nurse practitioner student, at Family Health Partnership Clinic in Crystal Lake Thursday, Oct. 20, 2016. The clinic has served McHenry County for 20 years. 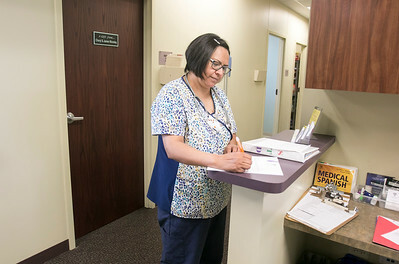 Sarah Nader - snader@shawmedia.com Medical assistant Alma Toranzo checks a chart while working at Family Health Partnership Clinic in Crystal Lake Thursday, Oct. 20, 2016. The clinic has served McHenry County for 20 years. 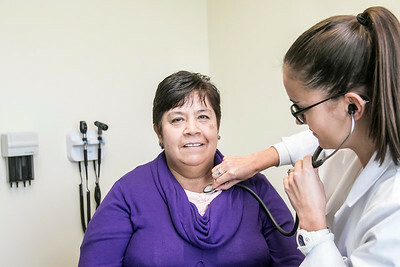 Sarah Nader - snader@shawmedia.com Matilde Macias (left) of Marengo is seen by nurse practitioner Elizabeth Rios at the Family Health Partnership Clinic in Crystal Lake Thursday, Oct. 20, 2016. The clinic has served McHenry County for 20 years. 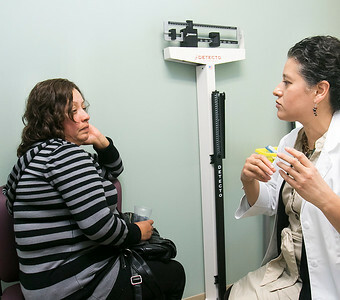 Matilde Macias (left) of Marengo is seen by nurse practitioner Elizabeth Rios at the Family Health Partnership Clinic in Crystal Lake Thursday, Oct. 20, 2016. The clinic has served McHenry County for 20 years.